How much is a lot of data ? Individual needs vary. Typically, a plan with more than 2GB ( approximate Australian Average usage ) can be thought of as having a ‘lot’ of data. The bigger your phone’s screen, the faster your network connection and the more video you watch on your phone, the more data you’ll need. 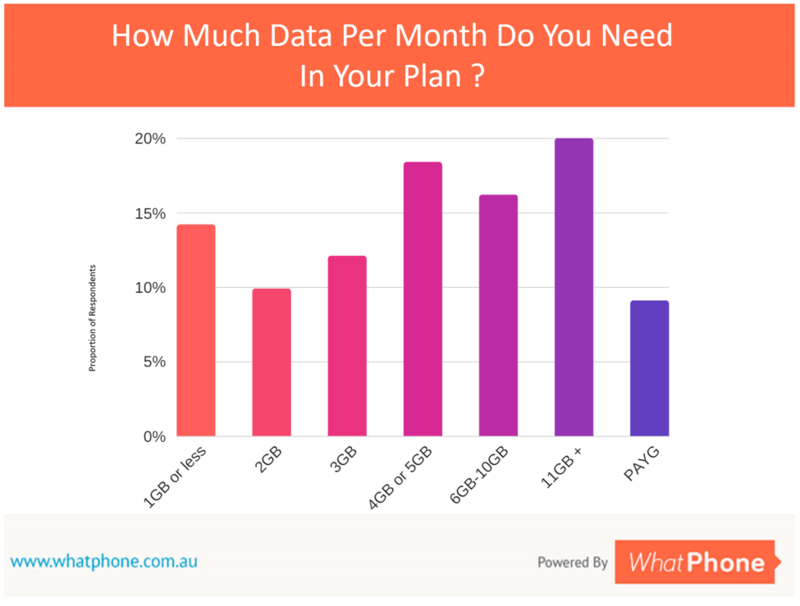 If you need help figuring out your usage check out our ‘How much data do I need?’ article. Some plans have ‘zero rated’ or ‘data free’ inclusions. What does that mean? Many plans have included data which is not charged for by the phone company. Optus’ Prepaid Epic Data plan, for example, have up to 10GB data added upon recharge for streaming Netflix and more. Other examples include OVO Mobile’s streamed video and Telstra’s sports data-free streaming content. Incredibly, this plan feature does exactly what you think it does. When you use the entertainment services provided by these companies, even if it’s video, the data you use will not come from your monthly bundle allocation. For example, if your phone plan has 6GB of included data and you watch 2GB of ‘data-free’ streamed video, you will still have your 6GB of data to use for other things. In the industry, this term is often called ‘zero rating’. You can find out more on this subject in our article dedicated to ‘zero rated data’. Where can I find out more about plans with a lot of data which ALSO offer free streamed audio ? Phone companies including Optus (their post-paid range) and OVO Mobile now offer plans which include data-free streamed audio. You can find out more about streamed audio and other phone plan entertainment offerings in our dedicated article. Who has the best value data inclusions in their plans ? A number of providers offer great data inclusions in their plans. You can see the best on this page. Yomojo Mobile, an Optus network reseller, offer the best data inclusions across their range in our view. They won our 2017 award for ‘Best Data’. I want a data plan for my Mobile Broadband Dongle or Tablet. Why get a Prepaid Data Plan? A prepaid plan, for a phone, with ‘a lot’ of data. A prepaid plan which is data only, used in a tablet computer or as a ‘mobile broadband’ service. People believe they need a lot of data per month. This is probably true, but their actual usage may be less. First and most obviously, in a world where people want to use a lot of data in their smartphone but don’t want to get ‘stung’ with extra charges, prepaid plans have an extremely useful feature. When the data in a prepaid plan runs out, the service will stop. At that point, the plan’s user has to make a conscious decision to recharge ( add more value by spending some money with the phone company, potentially on data. ) This single ‘plan feature’ means prepaid plans help users avoid bill shock better than the alternatives. Additionally, prepaid plans have to have a lot of data included in them. This is especially true for lower spend levels (of $30 and under) the nature of prepaid plans is that users are not tied into contracts. The freedom this gives them to change plan and provider (even every month if they so wish) means people move between providers and plans more often when they have a prepaid service. Phone companies, therefore, have to keep adding extra data over time. 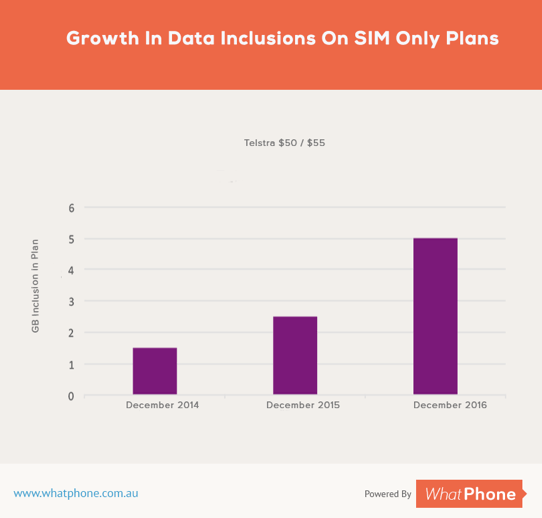 Our analysis shows that they (phone companies) tend to double the data inclusions their plans offer every 6 – 12 months. Prepaid plans, then, often include more data than their postpaid counterparts. The ever-increasing data in prepaid plans over time is important because of the way it overlaps with user behaviour. According to Cisco, data usage on mobile phones is increasing at around 80% a year in our region. As phone screens get bigger and connection speeds get faster and we become increasingly reliant on the internet — provided to us by our phones — to solve the problems we face every day, our requirements for data in plans continues to grow. By choosing a prepaid plan, not only do you get the data you need now, but you create a structure which gives you the best chance of getting more data as soon as it arrives, down the line. Whether you’re after a prepaid plan for your phone or a mobile broadband connection … ? 1. Step 1 – what type of user are you ? Check your existing phone bill to find out how much data your current plan has and the proportion of it you’re using. If you’re shopping around, you probably want more for the same price or less. The (usually electronic) statement your telco sends you is the best place to source your need. You can find out more about establishing your data requirements in our ‘How much data do I need’ article. As you will see from our detailed analysis below, it’s now extremely easy to compare the best prepaid plans with a lot of data. Consider our ‘Best of the best’ providers below. Pricing is now offered all per kB ( if you don’t know what that means, trust me, it’s a good thing ). Any prepaid plan with a lot of data has unlimited calls and SMS. They also all have 30-day recharge windows. That makes comparison extremely easy. It’s just what you’d expect — you’re looking for the largest number of ‘GB’ of data you can find. Everything else is the same. As we’ve said, one of the key features of prepaid is that you can change your plan or provider when you want to. Our advice is ‘don’t settle!’. Take the plan now, sure. But check again in a few months. You will be surprised at the additional data you get for your money in a few months. Here’s our table of what we think are the best of the best prepaid plans out there with lots of data. You will see that when you get into the details, (below) there is a slew of options and plan inclusions. That can make it daunting to compare what’s on offer. Just want a lot of data ? Here are the prepaid providers we think represent the best of the best for data. All of these providers have a self-service app which will assist you in monitoring and managing your data usage through your phone. A personal favorite prepaid plan, with an incredible amount of data (up to 15GB per month with the $60 MyCredit) included in it is Optus $2 Days. Uniquely, Optus $2 plan can be used one day and turned off the next. You only get charged $2 per day you use the service. On the days you do use the service, you will get up to 500 MB of 4G data for $2. If you go over the 500MB in one day, you’ll be charged another $2 for an additional 524MB. Kogan Mobile use the Vodafone 4G network. Their plans include substantial data allowances. If you buy 3 months or 12 months’ worth in advance, you will secure a discount on the 30-day monthly rate. Yomojo’s plans won the WhatPhone ‘Best for data 2017’ award. Simply put, Yomojo offers the best data pricing across its range of any Australian operator. Some people want a lot of data in their prepaid plan AND other features, too. Sport, music and international calls are common examples. Here are the best phone plans with big data allowances and these extras. Optus has been innovating its prepaid plans. Although their prepaid plans no longer offer data-free music streaming, the Optus Prepaid Epic Data plan offers up to 10GB on every recharge for streaming Netflix, Stan, and iView. To be able to take advantage of this, you must have an active plan with positive MyData balance. Not to be outdone by Optus, Telstra, too, has included some special value in its plans. Again, using their app, Telstra prepaid users can pick from a small range of sports to watch data-free on their device. If you like the NRL or AFL and can see yourself watching games on your phone, then Telstra prepaid could very well be the right plan suite for you. Some people want a lot of data in their prepaid plan AND the facility to make International calls. Lebara’s pricing for international calls stands out as best in-class value. The data inclusions are not quite as good as the others on this page, but the international call aspect of Lebara’s service gives it an advantage for people looking to kill two birds with one stone. OVO Mobile also offers prepaid plans with generous data allowances. But their prepaid plans come with unlimited data-free access to a number of sports. Check out the OVO Mobile review for details. As we cover on our standard prepaid plans page which goes into some detail on the subject, the term ‘prepaid’ is often misunderstood. Prepaid is not a single plan type, it’s a range. You will find the biggest data allowances on the ‘hero’ (most prominently featured) plans from each phone company. Plans with big data allowances start, typically, above the $30 per month level. You will almost certainly get unlimited voice and SMS in Australia for that sort of spend, whichever phone company you choose. As you will see below, this is one factor which makes comparing plans much easier than it’s been in the past. With a prepaid plan, you pay before you use the service. That means no credit is required and therefore no credit check is needed. Signing up to a prepaid plan is easier than signing up to a postpaid equivalent. Zero rating or ‘data-free streaming’ of some entertainment services within your phone plan is a relatively new phenomenon for Australia. We’ve covered the benefits to the user (you) above. If you’d like more detail on what ‘zero rating’ is, check out our article. Automatically pass on price reductions to existing customers ? The way data is charged to your account is beyond the technical interest of most people. It can, however, impact the value you get from the data you buy a great deal. The industry standard now is per kB charging, after an effectively delivered public outcry a couple of years ago to a Vodafone change which moved customers to per MB charging. Without going into too much detail, the results are pretty clear. Per kB charging is best, and anecdotal accounts I have heard suggest per kB charging can give you up to twice as much data as a per MB charged plan. The fact the phone companies we recommend all offer this prepaid plan feature means it’s easy to compare like-for-like data inclusions. Only OVO automatically pass on price reductions? OVO Mobile is a relatively new prepaid SIM provider that is doing extremely well. Part of their success is due to a plan feature which is unique to them. OVO is the only telco in Australia which passes on price reductions to their customers without being asked to. When they reduce their pricing – or increase the data allowance for the plan you’re on, you will get the benefit without doing anything. If you’re getting a prepaid plan, knowing whether it’s valid for 28 days or 30 days can make a small but worthwhile difference in the value of the plan you’re picking up. Obviously, if the plan has 28-day validity, every year and a bit, you’ll have to buy one more recharge than if your plan had a 30-day recharge validity. Again, the best of the best have all settled on 30 days so comparing apples with apples is easy if you stick to the plans we recommend on this page. There are 4 networks to consider here. Optus and Vodafone both have 3G / 4G networks with which most people are familiar. Then there’s Telstra, which covers a lot more ground but offers 4G to pretty much the same proportion of Australians as Optus or Vodafone. Telstra also ‘resells’ their network to smaller phone companies. Telstra is the only telco who does not resell its entire network. What you’ll get from the Telstra resellers are coverage footprints which are on a par with Optus’ and Vodafone’s. Every telco these days offers you an internet interface for your plan management. It’s usually a far more convenient way of keeping up to date with your account – especially the data utilization element of it – than calling into their customer care line. Most phone companies have a selfservice app which is even more convenient for those who have a smartphone. Since it’s people who have a smartphone that need to manage their data more closely, picking a telco which offers not just prepaid plans with a lot of data but also a self-service app, is something to be aware of. Of course, the cost of the plan is a key comparison characteristic. If you just want to compare prepaid data plans, you may be shopping for a ‘Mobile Broadband’ SIM ? As we said at the beginning, one key demand for prepaid plans with a lot of data comes from the ever increasing number of people who have a SIM, and often a second SIM ( in addition to their phone SIM ) for a tablet computer or mobile broadband connection. Data inclusions have become a staple in prepaid plans. Phone / SIM providers, including Optus, Yomojo, and OVO, have started offering data inclusions over 50GB per month on some of their prepaid plans. These plans are designed to substitute for home broadband connections. In time, we’ve seen the pricing of mobile broadband and fixed line ( home ) broadband come closer every few months. Most prepaid plans with data inclusions over the 50GB level have no voice included. Choose these plans only if you want to put the SIM in a tablet or dongle. We’ve talked about prepaid plans with a lot of data for either your phone or your tablet / mobile broadband dongle on this table. The overlap between them is called ‘Hotspotting’. Hotspotting is a facility offered by most smartphones, which allows you to turn them into a mobile router. For the non-technical, that means you select a menu item on your phone, enable it and you can connect your laptop to the internet using your phone’s data connection. If you have a lot of data in your plan, this is fine. It’s especially fine if you’re technically adept. If you’re neither of those things, this facility is something to be careful of. Laptops use a lot more data than phones (usually). We’re talking prepaid plans on this page, which means fear of overage is dramatically reduced. But be careful. If you have credit on your account AND you use your entire allowance, you will be charged extra for the data you use. We advise only recharging by the value of the plan you want to recharge. Or, use a bolt on. If you run out of data before the end of your month on your prepaid plan, every phone company will allow you to add more data mid month. This is something to avoid if you can. Whenever possible, figure out what data you need that’s more expensive than the data plan. You get some of the best data rated in the world in Australia. It’s a mark of how quickly we adopt new internet-based technologies. I just spent some time in Germany and just finding a phone plan with more than 1GB a month was hard – and prepaid plan costs were higher per month than in Australia, where we get multiple times that data inclusion. When it comes to getting a prepaid plan with a lot of data, competition has ironed out a lot of the problems for you. Plans are kB charged now, giving you more for your money. Prepaid plans from the best of the best providers shown on this page last 30 days, not 28 days. There’s incredible value to be found, usually with smaller phone companies. And the very fact that they’re prepaid means that if you recharge correctly ( i.e. don’t leave a balance on your account ) you will avoid bill shock. You simply can’t be charged overage. Once you have your prepaid plan and all the data you need, the most critical element of using it is to check regularly whether there is a better deal on offer. Since you’re not tied in to the provider you choose, beyond the month you’re in, alternative phone companies will be competing for your business and using data as the lure to attract you. Unless you’re with OVO Mobile that automatically passes on the extra data they add into plans, the great value plan you have now will be out of date in 6 months.